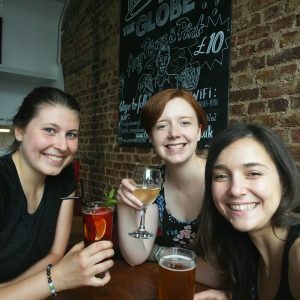 So here I am writing my ultimate blog for Charity Insights at the end of my internship at Marylebone FoodCycle. It has been a month full of new encounters, impactful experiences and blissful moments shared with the people I have met on my volunteering journey. I have written my last report and sent the last few emails as part of my project, and it is now time to reflect upon my experience. Working for Marylebone FoodCycle at St. Paul’s Church allowed me to get an insight into what working for the charity and social sector is like; it gave me a deeper understanding of the dynamics involved in such organisations. I loved being able to take part in multiple aspects of FoodCycle, beyond my own project, as not only did it show me the role of FoodCycle from different angles but it also triggered new contacts with people from incredibly diverse and fascinating backgrounds. Because people truly are the key in life experiences. It is through the encounters you make that you learn most about ourselves and about the world we live in. Leaving St. Paul’s was made easier after Alex, my supervisor and one of the hub leaders, Svetla, took me out to the local pub as a last goodbye. I think this underlines the nature of social charity work itself; because you are so involved with other human beings, your work inevitably becomes more humane. This is why I really recommend the Charity Insights scheme to every student at Imperial, and volunteering in general. I am so grateful of Imperial College for supporting what I believe to be an essential part of our education. It has allowed me not only get an appreciation of the sector and develop my skills, but also apply and share them for a critical social and environmental cause. Enjoying my Pimm’s on a glorious Friday at the end of my internship with Alex and Svetla.